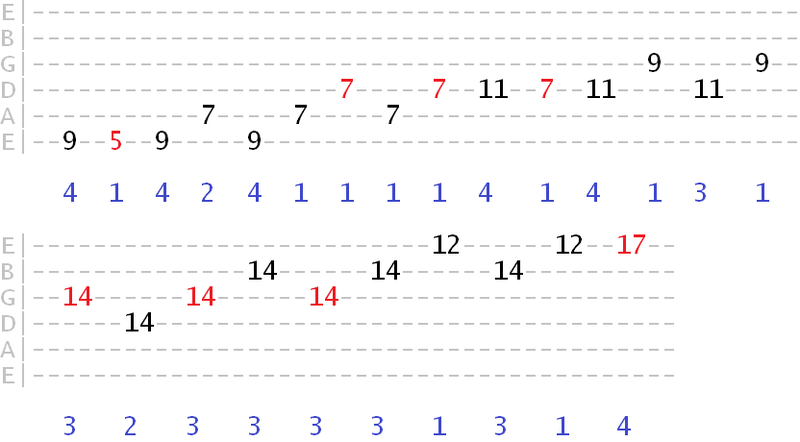 In the first part on major arpeggios, we learned some basic patterns and how to connect them across the guitar neck (the roadmap). We're now going to look at different ways in which we can navigate these arpeggio patterns musically. You'll be surprised at how much melodic colour you can squeeze out of just three notes. These exercises will also develop your fret and pick-hand co-ordination and fluidity of movement across the neck. This translates to ear-grabbing solos that connect to the chords you're playing over. No Paypal account required. Credit/debit card also accepted. Before, we were simply playing the arpeggio in its natural sequence - 1 3 5 1 3 5 1 3 5 etc. The exercises in this lesson are about creating alternative sequences, such as 1 5 3 1 5 3 1 5 3 etc. The result is a more dynamic, less linear expression of the arpeggio. It's about squeezing the most possible melodic colour from these three simple notes, simply by changing the order in which we play them. 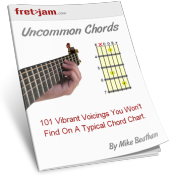 This not only sounds great, but it also gets you practicing key lead skills such as string skipping, sequential repetition and larger fret jumps. The video showed us a few examples, but let's explore the full potential of our major arpeggios using the exercises below. Try to devote at least 20 minutes per day to these and you'll be surprised at how quickly you progress. As always, use a metronome to speed up gradually, using increments of 5-10 BPM, only increasing the metronome tempo when you're 100% confident with playing at the current tempo. Staggered sequences can best be described as "interrupting" the straight sequence with a repetition of certain notes along the way. For example, here we play the arpeggio sequence as normal - 1 3 5 - but we interrupt it with a step back. So what we end up with is - 3 < 1 > 3 > 5 < 3 > 5 > 1 < 5 > 1 > 3 < 1 > 3 > 5 etc. You could describe this as "one step back, two forward". 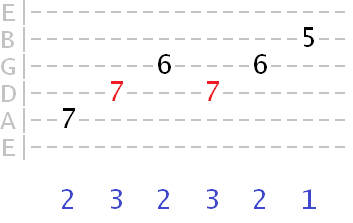 Although I've marked on the full, 6-string sequence, you can break these up into 5, 4, 3 and even 2-string arpeggios. 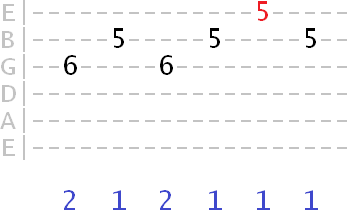 For example, you could just play the top 3 strings of the sequence. Need help with picking these exercises? 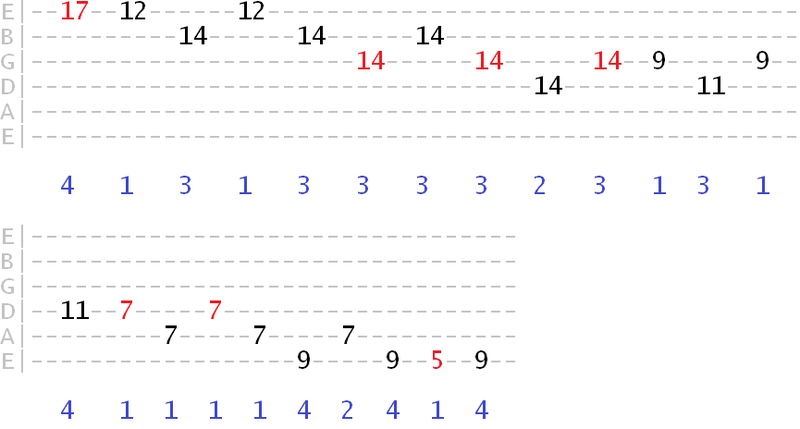 Get these exercises and more (including other chords) with economy picking mapped on to the tabs - click here for info. Remember, you can apply this sequence to any pattern from the first part, so refer back to the patterns as you plan your practice. You can also start on any position in the pattern - you don't always have to start on the lowest string and play through the entire pattern. Tip: be sure to practice these sequences in other keys. If you've learned the patterns from the 1st part, simply move the root of the pattern to the appropriate note - e.g. D for D major, E for E major, F# for F# major etc. String skipping is a powerful skill to have as a lead guitarist. It enables us to create even more dynamic arpeggio sequences. Plus, practicing these exercises will help to develop the muscle memory required to negotiate those more awkward scale movements. If you feel overwhelmed by any of these exercises, just remember as little as 20 minutes per day (on whatever days you can do) will be enough to see decent progress. Taking just the top 3 strings of the guitar, we can create repeating sequences up and down the entire neck. Great if you want to move smoothly and musically into a certain position on the neck for the next part of your solo. Notice how the first and last segments in that sequence are the same pattern, but an octave apart. So we've connected the neck-wide pattern. As mentioned before, you don't always have to play the entire neck like this. You can isolate and repeat any segments you want. By practicing these 3 types of arpeggio exercise - staggered, note skipping and fret jumping - you'll find that you become more skillful in moving across the neck and between strings fluidly. 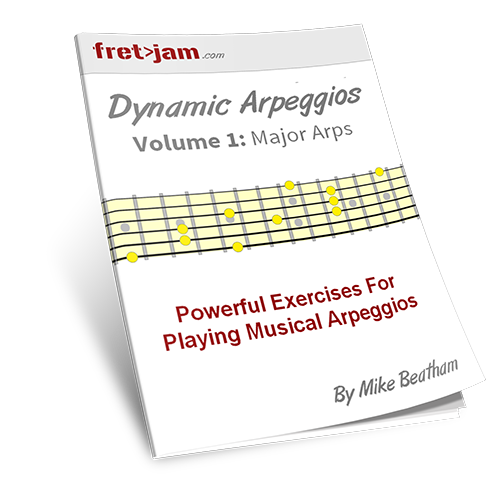 As well as resulting in great sounding arpeggio lines, the muscle memory you gain from these exercises will transfer over to other phrases and sequences you'll encounter, such as with scales. The ultimate aim is to get to the stage where you can confidently play anywhere on the neck, musically and smoothly. Given enough practice time, these exercises will prove a solid foundation for your lead playing for many years to come!